Glass Works Auctions closed up their summer sale on July 17th of 389 lots. Typically, the mid year sale does not contain their best offerings – this sale was an exception with a number of top notch items in several categories. The highlight of the sale was undoubtedly Lot 119, a clear (amethyst tint) figural BROWN’S / CELEBRATED / INDIAN HERB BITTERS brought $20,000. Thought to be one of only 3 examples, this rare bottle was recently found at a yard sale in the Seattle, Washington area. Most are familiar with the not uncommon amber “Indian Queens” but other colors are scarcely seen. Lot 1, a F. BROWN DRUGGIST bottle in emerald green with open pontil brought $6,000 despite cracks around the pontil scar. This bottle is noted by the auctioneer as unique. The description also states that Frederick Brown ran a drug store at the corner of Chestnut and 5th Street in Philadelphia and later became famous for his F. Brown’s Essence of Jamaica Ginger. The Jamaica Ginger bottles are quite common and known to most every bottle collector. Lot 2 was a beautiful deep emerald green DR GUYSOTT’S – COMPOUND EXTRACT / OF YELLOW DOCK – & SARSAPARILLA in perfect condition which closed at $5,000, a strong market price indicative of the overall auction results. Recession, what recession? There seems to be no decrease in antique bottle prices, except at the very low end (below $100) of the market. The sale included a good number of aqua pontil medicines which fared well. Also of note was the great offering of mineral waters from the Robert ‘Bob’ White Collection. A yellow olive Hanbury Smith NY (Tucker M-20-A) mineral water brought $1900, a blue green Deep Rock Spring quart (N-13-A) formerly in Norm Heckler’s collection brought $2000 and a GARDNER & LANDON / SHARON / SULPHUR WATER in olive brought $2750. Mineral water bottles, at least the good ones, are alive and well. The sale also included six Willington, Connecticut cathedral pickle jars, included a damaged example of the large mold in the extremely rare olive amber color. Prices ranged from $2300 for an example in greenish aqua to $3500 for the aforementioned olive amber piece to $5500 for a perfect condition large mold example in cornflower blue. 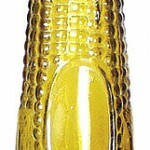 Perhaps the only bargain of the day was the sparkling perfect yellow National Bitters which closed at just $2400, well under its estimate. Overall, it was however a strong sale. Prices quoted do not include the 15% buyers premium. Wondering why all the other bottle auction houses provide catalogs of present and past auctions to buyers and later online for back checking except glass works. Are they that cheap?